I didn't go to Stonehenge for the Solstice. I didn't even leave my home town. I meant to. I don't mean I meant to go to Stonehenge, but go somewhere. I meant to celebrate the festival of Litha, or the longest day of the year, with fellow pagans in ritual as usual, but I didn't. I didn't even perform any devotions on my own. Instead, I wandered around my home town following a jumble trail. It wasn't just some random boot fair - it was a real community endeavour, and the first of its kind in my area. Around a hundred people from all over the town created the event. The idea was that between 10am and 4pm on Sunday, June 21 people set up table sales in their own front gardens. Beforehand, they signed up on the jumble trail website with their address and the kinds of things they were going to be selling. A co-ordinator created a printed map so people knew which streets to visit on the trail. Residents weren't only selling things like their unwanted clothes, books and bric-a-brac, they also offered things they had made and cakes they had baked. At one stall I was given a lovely refreshing glass of home-made elderflower cordial. People had hung out bunting and balloons, made posters and done all sorts of other things to make the event feel more like a village fete than a suburban jumble sale. There was a wonderful atmosphere - I got to talk to people who I had never met before and explored side streets I didn't even know existed. Everyone seemed happy, friendly and full of community spirit. But in taking part, did I neglect my spiritual duties as a pagan priestess and witch? Would it have been better if I had gone to Primrose Hill or Greenwich to honour the solstice with druids? Should I have gathered together with my witchy friends to cast a circle and offer libations to the gods and goddesses of summer? Many years ago, when I was still a novice pagan, I read the book A Witch Alone by Marian Green. At the time I was surprised that many of the exercises Marian suggested involved getting to know your area - learning about its traditions, folklore and history - rather than just concentrating on how to honour the ancient gods. Yet I soon realised that these things were all important aspects of being a true pagan witch. Marian also emphasised getting to know your own community and being part of it. In those terms, what I did on the Solstice was exactly the right thing to do as a pagan and a witch. I supported my own community, I learnt more about my area, and in a small way I helped with something that I hope will grow to be a tradition. Traditions aren't always about things that happened long ago in ancient pagan times and they aren't always about something religious. 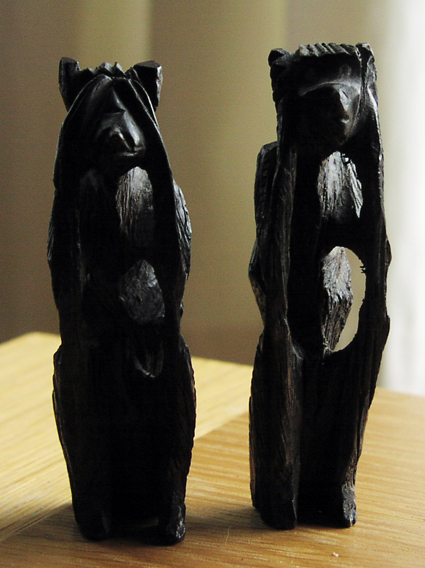 One of the things I bought at the jumble trail was a pair of wooden monkeys. You can see them at the top. They represent 'hear no evil' and 'see no evil'. There should, of course, be a third: 'speak no evil' - sometimes called 'do no evil'. I know I sometimes I speak my mind a bit too freely. The symbolism of the missing monkey is not lost on me. Although pagans don't really believe in Evil with a big E in the monotheistic sense, they certainly accept that sometimes people say things or do things that aren't the right things to say or do. But what do you think? Am I living up to my blogging name a bit too much? Was I in fact a bad witch?